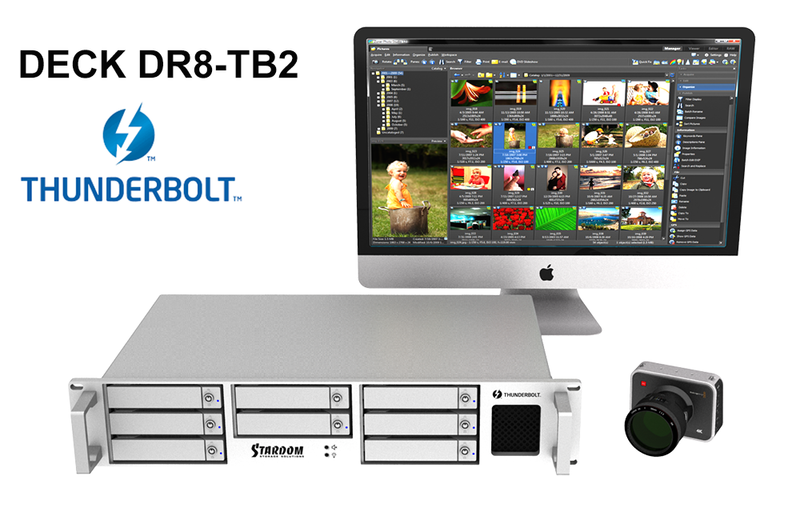 DR8-TB2 supports Thunderbolt 2.0 (TB2) interface for an extreme high data transfer speed. And both of the two TB2 ports are equipped with up to 20Gb/s data transfer rate which is 4 times faster than USB3.0 ,2 times faster than USB3.1 and even 3+ times than SATA III interface. You could definitely use it to play your 4K high-resolution films with no any lagging hassle. 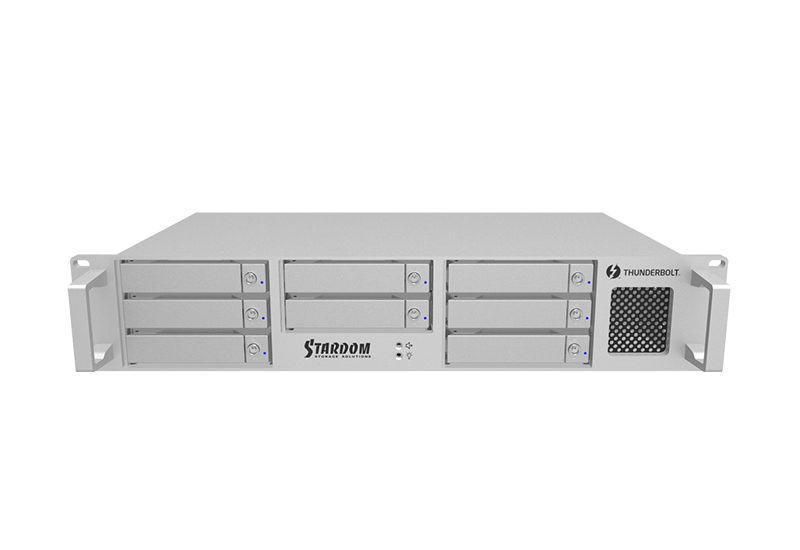 Thunderbolt 2.0 interface not only brings you this high data transfer rate advantage, it also let you chain maximum up to 6 products (or other compatible storage products). DR8-TB2 is built-in the easy-to-use hardware RAID, and it won’t hurt system performance during its REBUILDING WORK completely! 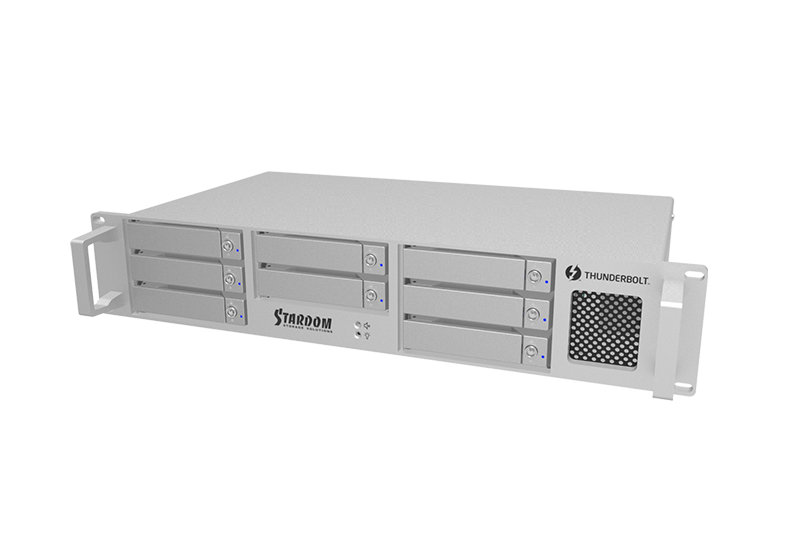 It would meet your requirement who always requests for both of system performance and the high memory capacity. DR8-TB2 with RAID 5 or even RAID 6 feature would be your best cost-effective storage solution at both of data protection and the system performance. It's really easy for you to set up your new buy DR8-TB2 in your office or even at home. Thru Marvell's MSU Tool, you could set up its hardware RAID thru a graphic user-friendly interface. 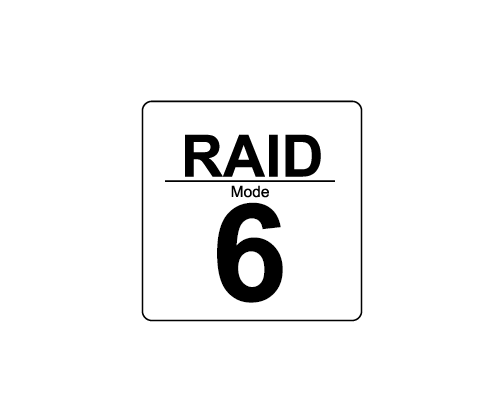 You could choose one of the following 8 different RAID modes, RAID 0, 1, 5, 6, 10, 50, 60 and JBOD, to fit your needs for the available large storage space together with its data protection feature. DR8-TB2 provides RAID 0 mode, and pluses its Thunderbolt 2.0 interface protocol, it really gives you an excellent data transfer performance up to 1300MB/s. It helps your heavy duty video or photos editing works in your Post-production studio. 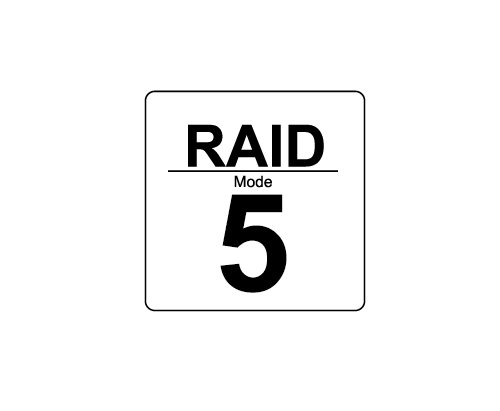 RAID 5 mode provides both of the read-&-write efficiency and the data protection features for your daily works. Under RAID 5 mode, DR8-TB2 would need at least 3 and three more HDDs to start working. And if anyone of your HDDs is defect, your DR8-TB2 would still work fine for you, but just with no more data protection feature. 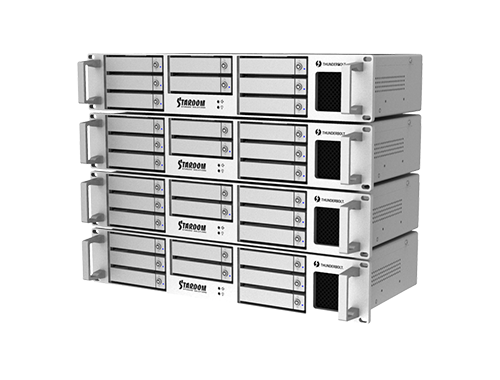 Comparing to RAID 0 and RAID 1 modes, it's no doubt that RAID 5 is your best choice. To you, an Enterprise MIS supervisor, the data protection feature would be your first priority to choose your storage product. Comparing to RAID 5, RAID 6 provides you a way better data protection level. Under RAID 6 mode, DR8-TB2 would need at least 4 HDDs to start working. 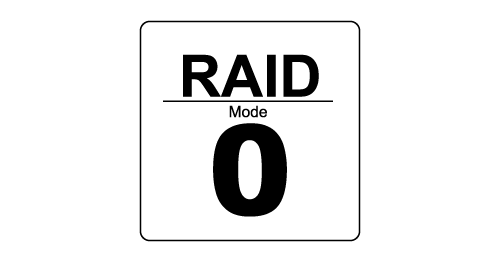 RAID 6 mode provides you the even better data protection than that of RAID 5's from its extremely ZERO Possibility that two HDDs become defect at the same time! DR8-TB2 still works perfect even though two of the whole HDDs are defect at the same time which won't happen at all! 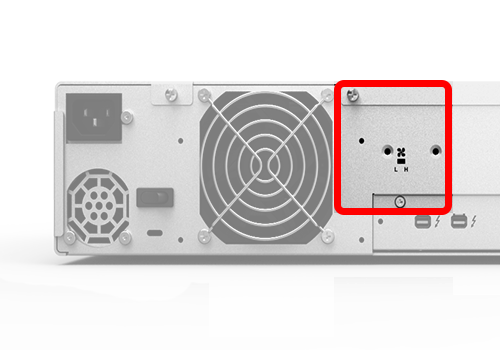 As you know, every RAID mode has its restriction to extract HDD out from every storage enclosure. 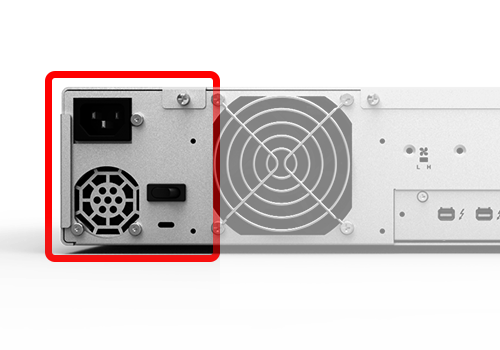 And DR8-TB2's new Tray Lock will protect you from your improper HDD extraction accidently! Without its Lock Key, it's some hard for you to extract any HDD out! 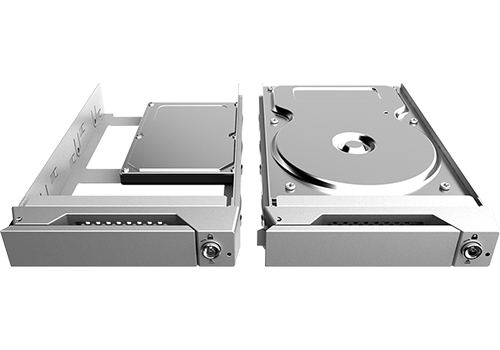 From our genius design, you could use both of 3.5" HDD and 2.5" HDD/SSD for your DR8-TB2 product which give you either the mass storage space from 3.5" HDDs or the data transfer rate from 2.5" SSD products. 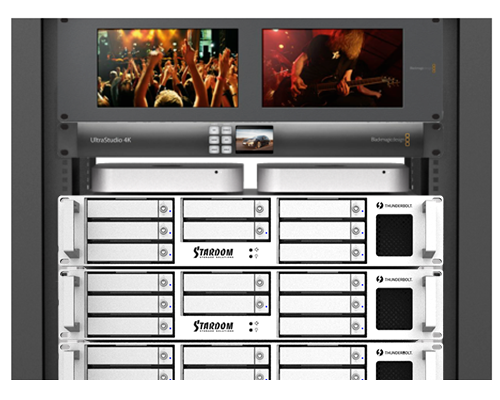 And DR8-TB2 is designed with a solid aluminum chassis for both of product protection and the good finishing quality! DR8-TB2 provides the SGPIO (Serial General Purpose Input & Output) features. The SGPIO feature detects the following system failure symptoms: the defective HDD(s). DR8-TB2 is designed with a rigid mechanical structure and covered by a high finishing quality aluminum chassis. It's also designed with two 8 cm large quiet fans to help getting rid of heat efficiently! DR8-TB2 is also designed with the MCU feature which monitors and helps improving its in-chassis system temperature. While the system temp. 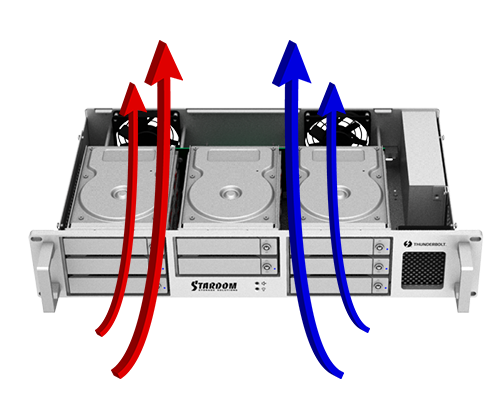 rises up to 50 degree-C (118 degree-F), MCU will bump up the two 8 cm fans with full speed; and once system temp. goes down to 45 degree-C (109 degree-F), MCU would reduce the fan speed down to a half speed for a better green user environment from a less fan noise and lower power consumption. 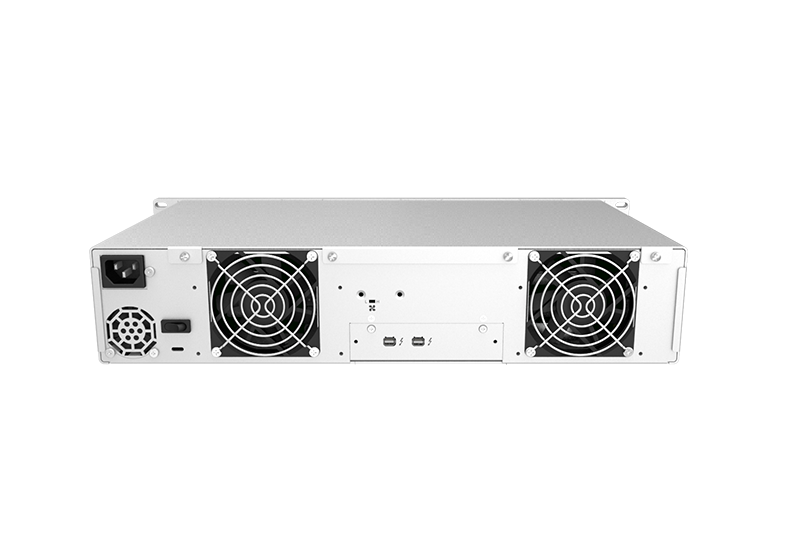 DR8-TB2 uses a UL/CE certified 300W power supply unit which provides a stable and high efficient power output and definitely satisfies the big power consumption from all 8 HDDs. 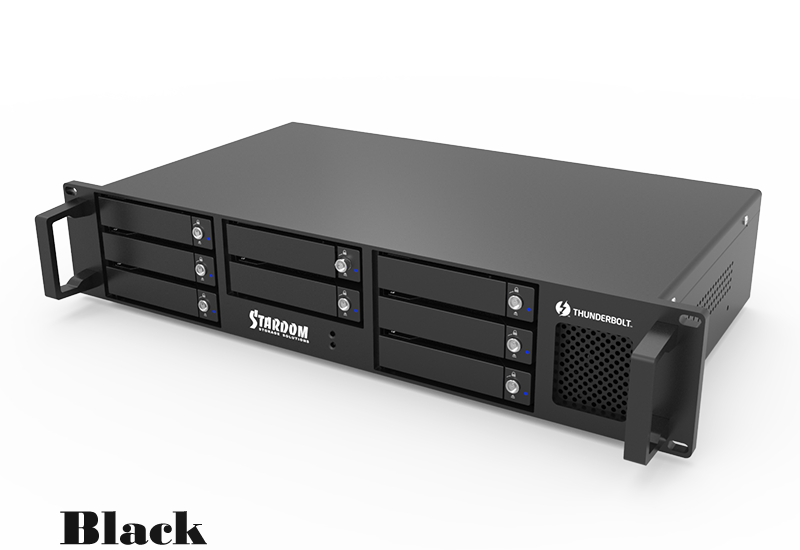 Even though it's a standard 2U rackmount chassis size, DR8-TB2 still has a fashion ID to match your Mac PC while standing beside it. It's well protected under its aluminum chassis which also helps dissipating heat too! 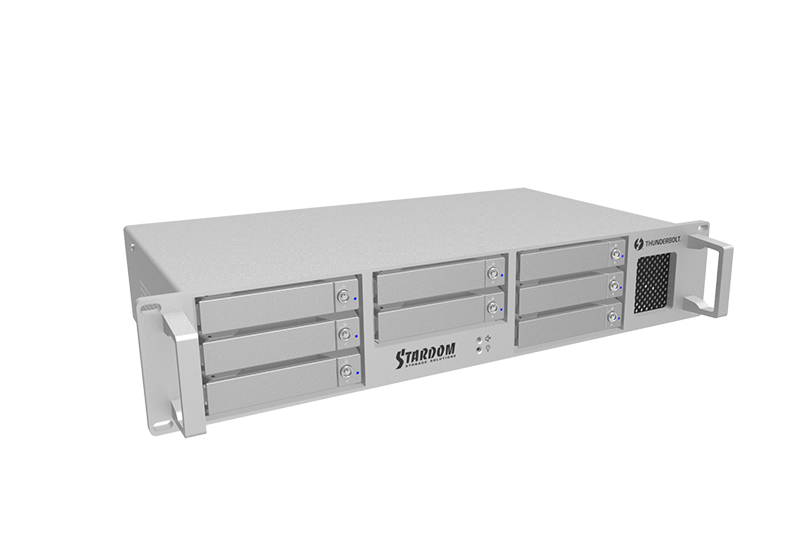 DR8-TB2's new chassis design is from our brand-new placement concept for all the parts and components which give you the elegant ID for the stand-alone use or its standard 2U rackmount design to perfectly fit into your server rack. DR8-TB2 is designed for you to pile them up together firmly. It occupies only for two A4 paper size at your desk if you pile them up together. And of course, you could mount DR8-TB2 at your server rack too! 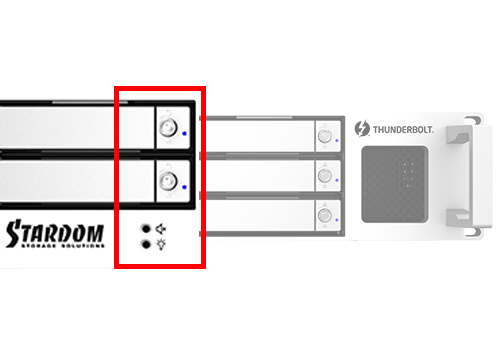 You could easily install your new DR8-TB2 into your standard 19" server rack for both of server and workstation applications. 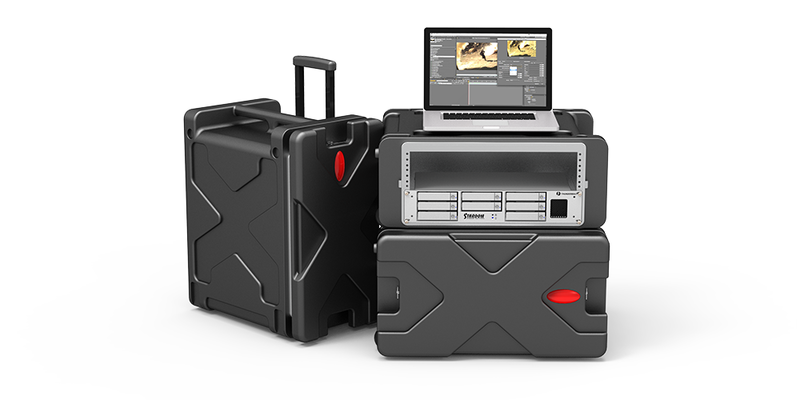 It's no longer a tough work for you to travel with the DR8-TB2 unit(s). You just need a transportable case to carry it with you for trip! The full aluminum DR8-TB2 chassis helps reducing the total weight for your travelling. 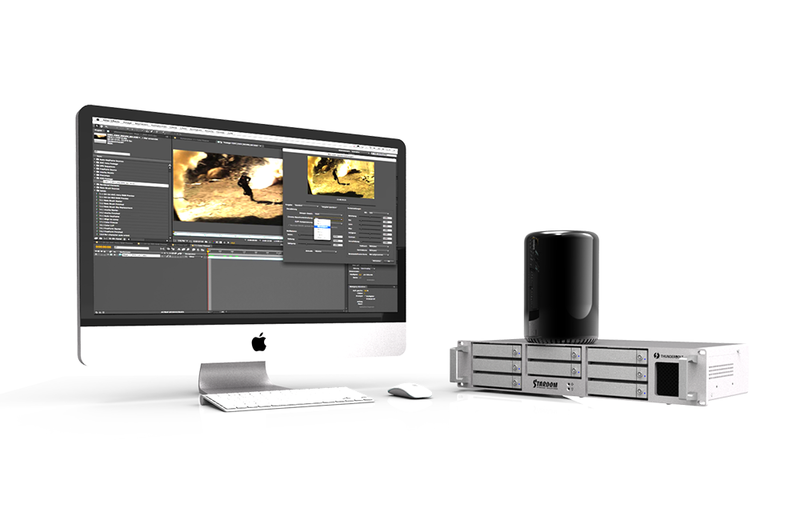 Your Mac Pro Cylinder could connect to one DR8-TB2 and chain to more DR8-TB2 products for a huge memory storage capacity thru its high performance Thunderbolt 2 interface. You could definitely enjoy its huge memory capacity together with the RAID 5 or even RAID 6 setting for an excellent data protection. Since DR8-TB2 provides two Thunderbolt 2 ports, just use your MacBook Air, you could set up your own full function photo studio right away. You could then save tons of RAW images. And of course, you could edit and process the images quickly once you set up your DR8-TB2 with RAID 0 feature.